After his treatment in the Copenhagen clinic and his return to Norway in 1909, Munch set up an outdoor studio for the summer, and turned to his biggest projects since the Frieze of Life in the 1890s. In 1909, Munch had competed successfully to provide a series of eleven huge paintings to decorate the new Hall of Ceremonies of the University of Oslo. He showed preliminary studies for these monumental works in Oslo in March 1910, and worked for much of the years to 1916 in properties which he purchased specially to provide sufficient space. His plans for the paintings remained controversial, and the subject of ongoing discussions between Munch and the University, until their acceptance and his victory in the contest in 1914. There is a consensus that the three most significant paintings from this series are The Sun, History, and Alma Mater. Edvard Munch (1863–1944), The Sun (1910–11), oil on canvas, 450 x 772 cm, Munchmuseet, Oslo. Wikimedia Commons. 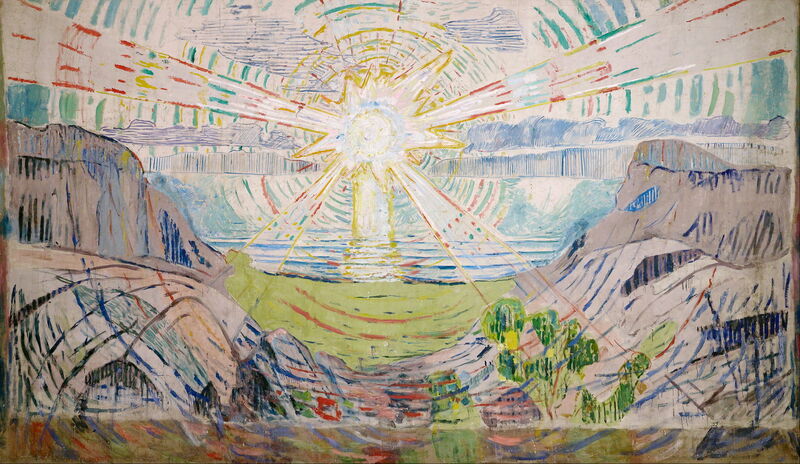 The Sun (1910–11) is as different from Munch’s paintings during the 1890s as you could imagine. It shows the sun recently-risen over the sea, viewed from a point high above a Norwegian country valley. Its sparse application of paint and geometric arrangement of rays and arcs is reminiscent of the paintings of William Blake (although I have nowhere seen that Munch took any interest in Blake’s work). Edvard Munch (1863–1944), History (1909-1916), medium not known, dimensions not known, Hall of Ceremonies, University of Oslo, Oslo. Image by Tore Sætre, via Wikimedia Commons. History (1909-16) has a similar light and open style. An old man sits with a young boy under an ancient tree, set on a rock pulpit somewhere on the dissected coast of Norway – a zone referred to by those who navigate its waters as the Inner Leads. Edvard Munch (1863–1944), Alma Mater (1909-1916), medium not known, dimensions not known, Hall of Ceremonies, University of Oslo, Oslo. Image by Tore Sætre, via Wikimedia Commons. Alma Mater (1909-16) plays on the term used worldwide for your former university, which is derived figuratively from its literal meaning of nourishing mother. Again it is set somewhere along the Norwegian coast, which here is less rugged and includes the undulating sweep of a bay which appears in so many of Munch’s earlier works. Sat under the shelter of a younger tree is a mother, dressed in Norwegian costume, who is feeding a young infant at her breast. Three other young children play close to her side. On the right is a small clump of birch trees, another characteristically Norwegian sight. The sky is formed from a fascinating combination of linear blots of blue, between the clouds, and a contrasting pattern of pale brushstrokes. Edvard Munch (1863–1944), Galloping Horse (1910–12), oil on canvas, 148 x 120 cm, Munchmuseet, Oslo. Wikimedia Commons. 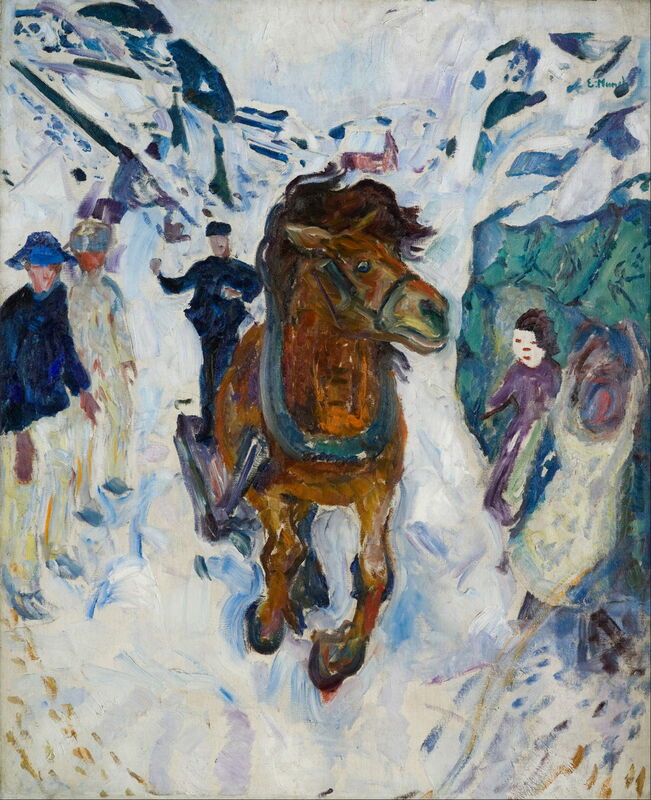 Other paintings from this period show how vigorous and dynamic Munch’s facture had become: for example, Galloping Horse (1910–12) shows a horse-drawn sleigh being driven at speed along a packed snow track in the winter. In 1912, two important overseas exhibitions featured his work. At the Sonderbund Exhibition in Cologne, Germany, he had an entire room devoted to his work; other artists represented there included Vincent van Gogh, Gauguin, Cézanne, and Picasso. Another exhibition of modern Scandinavian art, which included Munch’s, toured New York, Buffalo, Toledo, Chicago, and Boston. After a series of moves to accommodate his large works, in 1916 he finally settled at Ekely, which was then just beyond the western edge of Oslo, where he was based until his death, a recluse for much of that time. Later that year, his paintings for the University of Oslo were finally accepted and hung. 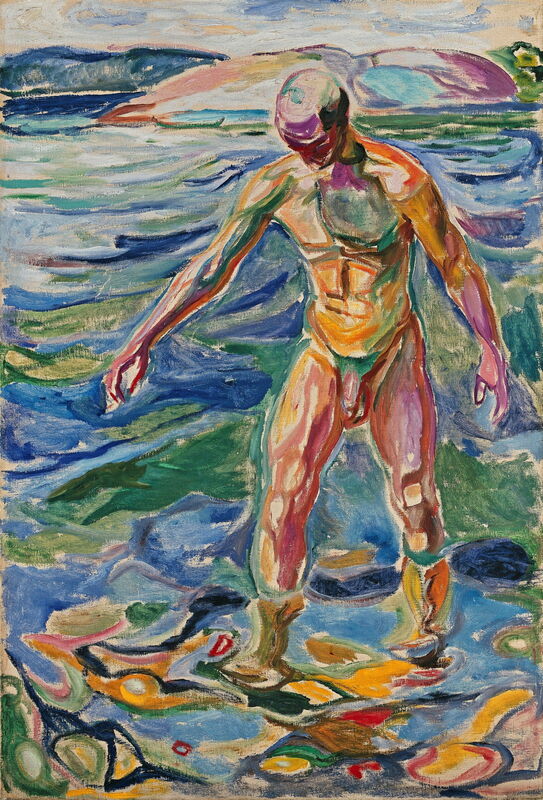 Munch’s dazzlingly vibrant Bathing Man (1918) is also set on the coast of Norway. The figure and the landscape in which it is set are fashioned from bold strokes of pure colour, which he modulates skilfully to show the bather’s lower legs under the water. Later, Munch developed his outdoor studies of bathing figures with the intention of creating a series of Love motifs for the intended new city hall of Oslo, but the series was never completed. Edvard Munch (1863–1944), Sleepless Night. Self-Portrait in Inner Turmoil (1920), oil on canvas, 150 × 129 cm, Munchmuseet, Oslo. Wikimedia Commons. Munch was not entirely free from anxiety and melancholy, though. In his Sleepless Night. Self-Portrait in Inner Turmoil (1920) he stands, gripping his jacket, presumably in a room at Ekely. Edvard Munch (1863–1944), Model by a Wicker Chair (1919–21), oil on canvas, 122.5 x 100 cm, Munchmuseet, Oslo. Wikimedia Commons. In these later years, he also explored the relationships between the artist and their model. Model by a Wicker Chair (1919–21) features similar high chroma colour in formed strokes and lines to his other paintings from this period, although the artist himself is not shown. Apparently Munch had no difficulty in attracting young models to pose for him at Ekely. In 1921, Munch was commissioned to paint another series of large works to decorate the canteen of the Freia chocolate factory at Oslo, which he completed the following year. In 1922, he had a major retrospective exhibition in Switzerland. Recognising the dire financial straits of many German artists following the First World War, he purchased seventy-three of their works, and in 1924 he gave some of his own works to be sold for their benefit. Edvard Munch (1863–1944), Starry Night (1922–24), oil on canvas, 120.5 × 100 cm, Munchmuseet, Oslo. Wikimedia Commons. Munch returned to painting landscapes after the War. 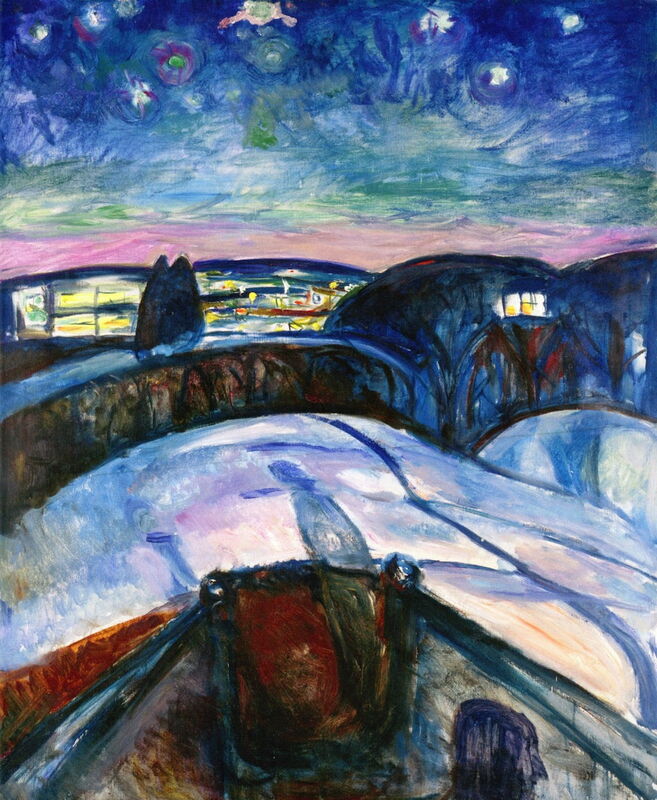 Starry Night (1922–24) is one of the most distinctive of these, showing the woods and snow-covered hills which lay outside the distant city of Oslo. In 1927, major retrospective exhibitions of his work were held at the National Galleries in Berlin and Oslo. Munch also purchased his first movie camera, and started making his own cine films. However, in 1930, he required a period of treatment for eye problems, whose effects he documented in paintings. These visual disturbances recurred in 1938. 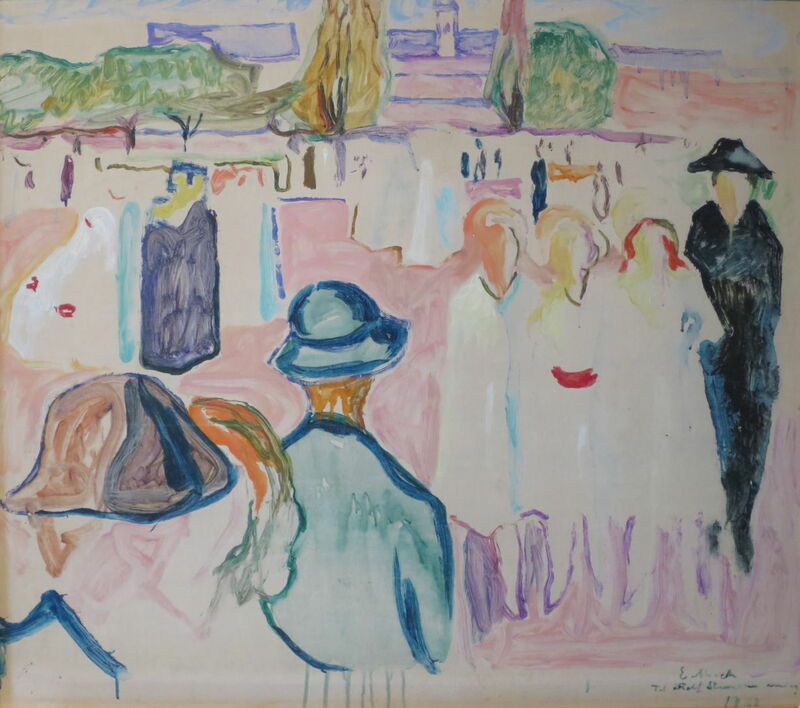 Edvard Munch (1863–1944), Summer on Karl Johan Street, Oslo (1933), oil on canvas, dimensions not known, Bergen kunstmuseum, Bergen, Norway. Wikimedia Commons. Munch continued to paint through the 1930s, although little of his work from those years is well known. Summer on Karl Johan Street, Oslo (1933) shows how much his style continued to evolve, and contrasts with his dark, anxious and melancholic street scenes from before 1900. In 1933, he was honoured with the Grand Cross of the Royal Norwegian Order of Saint Olav. In 1937, Nazis in Germany condemned eighty-two of his works as being ‘degenerate’, and confiscated them from public collections. They were brought back to Norway and sold at auction in Oslo in 1939. 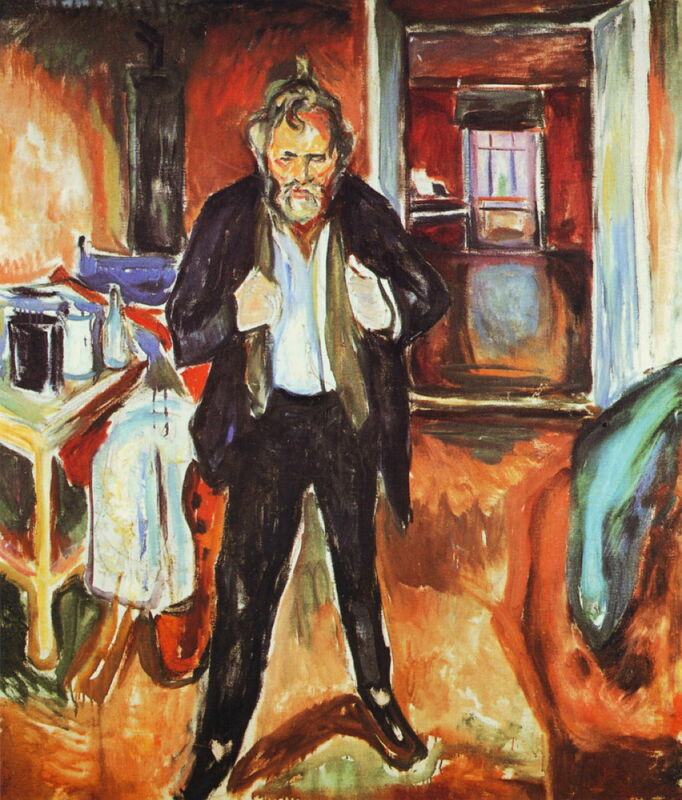 After the invasion of Norway in 1940, Munch lived alone at Ekely and avoided all contact with the occupying forces. He died there on 23 January 1944, leaving all his remaining work, including 1100 canvases and 18,000 prints, to the City of Oslo. Those works are now in the Munch Museum in Oslo, which opened in 1963, to commemorate the artist’s centenary. 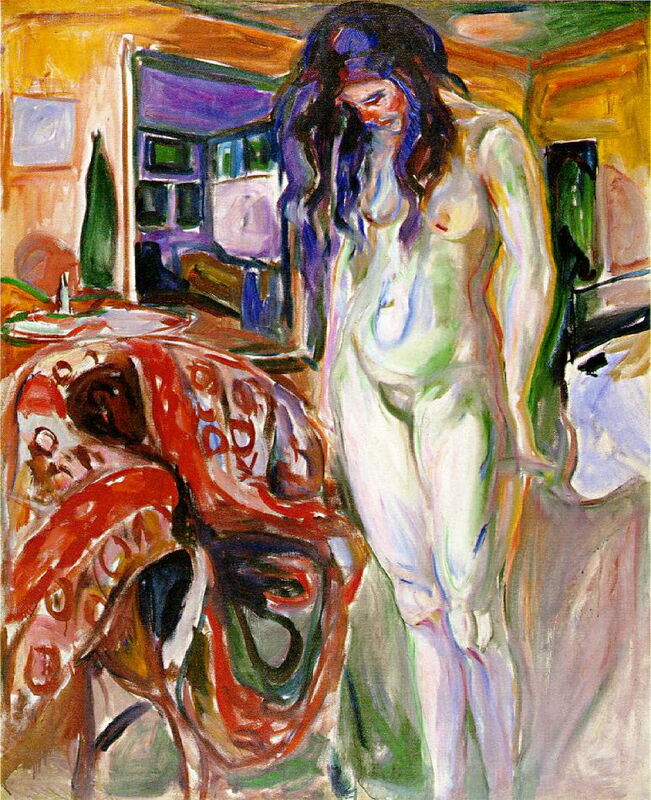 Having given a brief overview of Munch’s career and work, my next article in this series will start to examine the Frieze of Life, the series of paintings mainly made during the 1890s which Munch considered to be his most important work. Posted in General, Painting and tagged Blake, Cézanne, Gauguin, Munch, Norway, painting, Picasso, van Gogh. Bookmark the permalink.